The ES Network launched the SuccessInTrucking.com website in November of 2016. 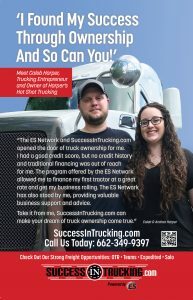 As part of the overall initiative to offer ownership opportunities across the general trucking market, the ES Network developed ads that have been featured in national publications. Note: These appeared as half-page ads in Landline. The art has been compressed for the web. Note: These full-page ads appeared in publications developed by Randall-Reilly focused on company drivers and owner-operators. They helped to support a digital marketing campaign conducted by Randall-Reilly. Once again, the artwork has been compressed by the website. 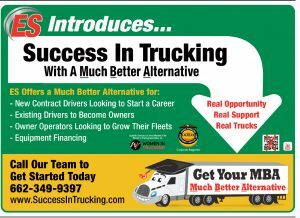 Note: As with Round 1, this full-page print ad was placed in Randall-Reilly publications focused on company drivers and owner-operators. 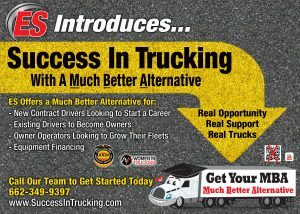 This ad featured Caleb Harper, who has became an owner-operator through the ES Network.